This allegory would translate to “comfort is nowhere in the world but in the meditating abode of Chajju (Bhagat)”. It tells the reader of the comfort and solace from the hardships of life that is discovered at this simple and single room (chaubara) is far superior than the one to be experienced in Balkh or Bukhara. Bactria (also Balkh) has been an ancient abode with religious significance associated with Muslims, Buddhists and Zoroasters alike. Arabs called it Umm-ul-Balad (mother of all cities) due to its antiquity and significance. Balkh, that once was a flourishing province in Central Asia, now lies in ruins in present day Northern Afghanistan. Bukhara a city in present day Uzbekistan, is another ancient center of significance in terms of culture, trade and religion. Located on ancient Silk Road, this city was a part of the Persian Empire and has also been an intellectual center of the Muslim world in the era of Samanids. Both Balkh and Bukhara symbolize a significance in terms of culture, religion, scholarship and trade from the ancient times. And here we have a parable that goes by claiming that there was a place that, in meditation and spiritual seeking, outdid even the grand significance of Balkh and Bukhara, and it existed right here, in the city of hearts. Dear readers, a city in my heart and (I am sure) yours alike, the City of Lahore. Mythical yet a physical reality, Chajju da Chaubara is craftily concealed in the modern day construction on top of old Lahore. It was one of the business meetings at Saira Memorial Hospital and we (me and Khurram, the energetic Marketing Coordinator) were in attendance at the office of Hospital Administrator. Mr Mazhar, with whom the business relations would soon transition to a close friendship, was in the midst of his signature style of storytelling as we sipped tea. Talking about old Lahore and the buildings of old city, he asked if we had seen that famous Chajju da Chaubara, and as a perfect dressing onto my history appetite, he narrated the allegory, with which, dear reader, this article begins. Under sheer excitement, I took a turn in my chair, “where exactly is this chaubara located!” “They say it’s in old Anarkali somewhere”, was the reply. I had no idea, that something so famous to have developed into a parable would be so hard to discover. An internet search brought up a number of news articles alarmed on the premonition that the said chaubara was to be wiped out entirely from surface due to Mayo Hospital’s expansion, but these were quiet on where exactly this piece from history was located. Mayo Hospital had been in the process of gradual expansion for some years and there was almost a certain chance that this chaubara was already lost to the cruelties of time. On the next available opportunity, I contacted the administration of Mayo Hospital, but no one knew about any such thing that goes by the name of “Cahjju da Chaubara”. In the desperate attempts to find some clue, I met this person in Administration Offices who said, “show me the picture of what we are looking for!”. I had none at that time and I was to discover later that the pictorial search for our beloved chaubara was to unfold some new avenues and eventually bring out some lead towards seeking the abode of forgotten Chajju Bhagat. A research focused on imagery did bring up two pictures of interest. 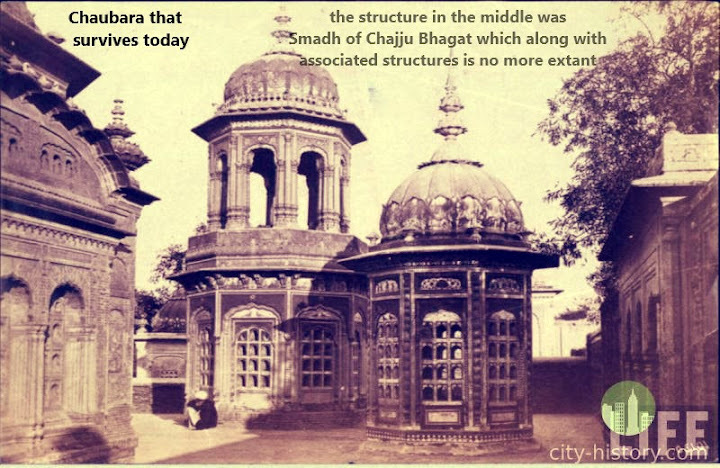 One was a that of a three storey structure, reportedly taken in 1940 (we shall come to that a bit later in this article) and the other was a drawing sketch comprising of a number of structures with the typical architecture from late Mughal / Sikh period. 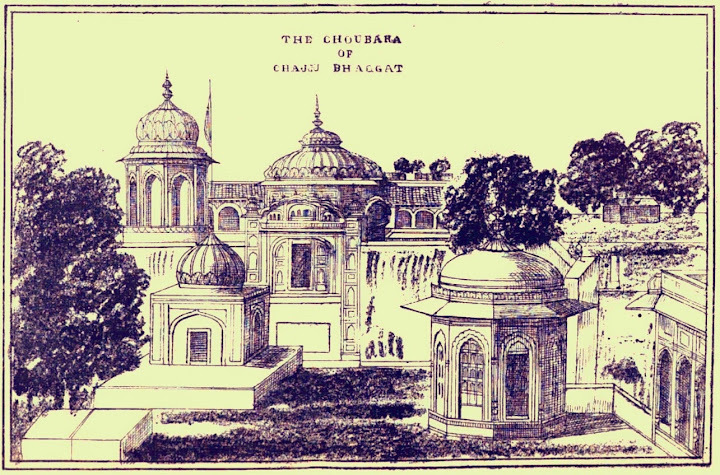 The sketch was titled “Chaubara of Chajju Bhagat” and was found right on the pages of “History of Lahore” compiled by Historian Latif (later translated and illustrated by New Imperial Press Lahore in 1892). 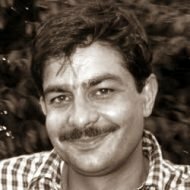 Dear readers, it’s Historian Latif who brings to us the details of Chajju Bhagat. He was a money-man, a sarraf (gemstone dealer) by profession from the times of Shah Jehan. Inspired by a sect of people called fakirs (spiritual persons who become self sufficient by renouncing the worldly desire of money and possessions), Chajju is said to have become one himself, abandoning the wealthy pursuits and restricting himself to his single storey room seeking self meditation. This room, over time was to become the famed “Chajju da Chaubara”. Chajju Bhatia, who later was revered as Chajju Bhagat (owing to his devotion towards prayer and meditation) is reported to have died in 1640 CE. Latif tells us that a mandir at the place of the chaubara itself was built probably during the times of Aurangzeb. Bawa Pritam Das of Pakpattan, a prominent saint from Udasi Panth is said to have built this mandir during the time when he was working in the ‘Office of Mahant’ at Lahore. Bawa Pritam Das is the same saint who is said to have baptized Baba Bhumman Shah of Dipalpur. If one travels on Dipalpur – Okara road, there is this village Bhumman Shah with remains of a grand mandir and a dharamsala (pilgrims hostel) attributed to this great saint from late 17th century CE. Coming back to the Mandir of Chajju Bhagat, this edifice is also reported as one of the iconic buildings of Lahore from the times succeeding Mughal ruler Aurangzeb on the pages of “The Encyclopedia Britannica, A Dictionary of Arts, Sciences and General Literature” (published in 1891). Latif mentions that this mandir is located in Mayo Hospital near the Serai of Ratan Chand. After the death of Chajju Bhagat, which is reported as a mysterious disappearance, his smadh was also built here, just beside the mandir. This area became a center of attention in the reign of Maharaja Ranjit Singh who was a regular visitor here. He is reported to have built a series of chambers and accommodations for the yatris, who used to crowd this place on Mondays and Thursdays and there were rituals like devotional songs performed on these gatherings. For years this spiritual complex stayed under the care-taking of the mahants from the panth (lineage) of Dadu Ram, a saint of influence from the times of Akbar. Latif also mentions of the religious book that was kept here and which in relation to the founder mahant was called ‘Dadu Ram ki Bani’. Also during his times, Latif mentions of an ancient well and two associated water cisterns in the area of Chajju Bhagat’s Mandir. The larger cistern had this interesting tale associated with it. Legend has it that Chajju, through a miracle had caused the holy river of Ganges to flow out of this large cistern. An old woman, a devotee of Chajju sought a leave to go for bathing in the holy river of Ganges on the eve of Baisakhi. Chajju asked the woman not to travel that far to Ganges as the river itself would come to her, and reportedly, it did! All these stories and the sketch itself had ignited the passion to retry the search in the area of Mayo Hospital and there I was, back at the administration offices. The sketch did portray a wide area comprising of a number of buildings, one of which was Chajju Bhagat’s Chaubara, but it had seen a lot of transition over time. Layers of earth from time had enveloped much of the ground and on the place itself now stood the modern buildings of the hospital. The sketch failed to ring any bells with the people at the hospital and I was back to the dead end. At this time, I had to rely on the other picture and that, dear reader, was to bring up some interesting find. 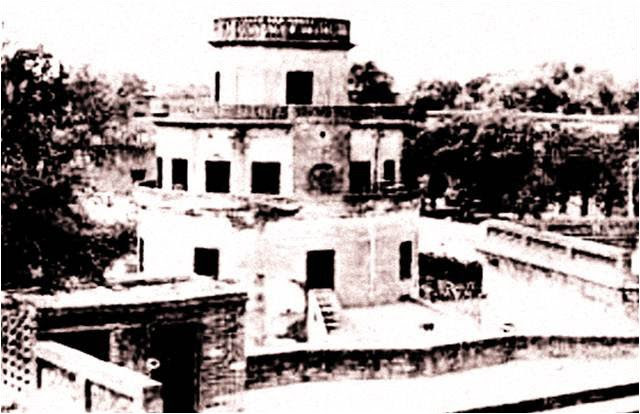 The other picture of interest dated back to some time around 1940, and was of a three storey edifice that reportedly existed in the area of Chajju Bhagat’s Chaubara. Though it did not picture the chaubara itself, and was confusing as to the identity of the structure, it played an important role in leading me to the actual destination. As I encountered the administration offices with my prized possession of the pictures, this was the one that got immediately picked up by the familiar eyes of the Mayo Hospital staff. I was directed to the parking lot of the hospital that corners the junction of Nisbat and Railway roads. It was indeed the building that very much resembled the one in the picture. It now was a residential complex divided in piecemeal among the hospital’s employees. I had to negotiate my entry into more than three households to have an access to a few of the architectural remains. From the side of Nisbat road, the frontal face of the building had the original colors and appeared as a religious structure, most likely one of the pilgrim’s hostels. On the opposite side, a couple of canopied chambers surviving on the rooftop authenticated the antiquity of the structure. Though not a hundred percent, but the outline of the structure resembled a lot to the one in the picture taken during 1940s. I was now somewhere on the periphery but was still banging my head with the closed walls in a desperate attempt to locate, if it had survived to exist, the Chaubara of Chajju Bhagat. And there came the clue from the chowkidar at the parking lot who got engaged into a conversation due to the extensive photographing activity I was involved with. The gentleman told me to go nowhere but head straight to the Convalescent Home at the Mayo Hospital. I was eventually there, at the Convalescent Home, and dear reader, I was tracing my footsteps on the path Chajju took many a times to reach his chaubara to immerse into self meditation. I walked down a relatively narrow walkway between the two storey building of Shams Shahabuddin Convalescent Home at Mayo Hospital Lahore and was greeted by a single dome structure radiating and aura of pure aesthetics. This rehabilitation center, took extra-ordinary care to preserve this historical structure just in between their newly constructed rows of rooms. I was welcomed by the hospital staff at the Convalescent Home and was afforded the opportunity of a detailed visit. The chaubara itself is built on a square platform around 20 x 20 ft in dimension with entrance on one side. The architecture is a mix of late Mughal and Sikh styles. The building materials are primarily the fired bricks and red as well as white sandstone. The niches, arches and the dome along-with the ornate add-ons reflected the architectural finesse. The dome is white, squircle in shape, resembles an inverted lotus flower resting on an octagonal base that extends down to the floor. The interior of the chaubara, though scorched, yet presents a sight for sore eyes. The alcoves on two levels, arches and jharoka style windows are a class apart in artistry. The floral motifs and intricate metal work on the interior of the roof reminds one of the Sheesh Mahal artwork from Lahore Fort. And if my readers want to further their interest in the architectural details, I shall recommend a very informative article by Maria Ashgar that can be referenced here. The walkway to the chaubara had two square shaped tiled mosaics with old styled patterns. These were the recent add ons and nicely complemented the outlook of the historical structure itself. The Chaubara of Chajju Bahagat is now in use as a makeshift mosque and I was afforded some time in solitude inside the room. Having reflected a bit on self meditation inside the chamber and having appreciated the architectural artistry both from the interior and exterior of the structure, I extended a formal note of gratitude to the Administrative Officer at Shams Shahabuddin Convalescent Home and took my leave. Great work. Well done. It was a discovery to me. It was a discovery to me as well, dear Sir. Thank you for the visit and stopping by to comment. Very well written. During our school days we were told to explain the meaning of this phrase “jo sukh chhaju… ” but now I know the meaning And history. You are very welcome Paramvir. Thank you for visiting. I feel fantacised to see your artical. I was logging to find any realistic photographs and latest information about this place. Haveheard thousands of stories about this place from my grandparents who were immediate neighbours of this place duringpre partion era. Thank you very much Pulkit for the visit and comments. Good to know of your association to the place. And yes, do plan a visit and you shall be welcomed by the traditional Lahorite hospitality. Read about Chajju in one of Majid Sheikh sahab’s book. I think even he was not absolutely sure about the location. I would definitely visit the place soon. Thanks for the effort to research it and then for sharing! I have heard that the original chaubara is no more, only the “samadh” – the one in the pictures.